How’s your 2018 been going for you? Mine has been super busy but extremely productive and more profitable than I expected. So I thought I’d catch you up on lessons I’ve learned with my new site, struggles, personal growth and other insights. The year started off on a fun note. 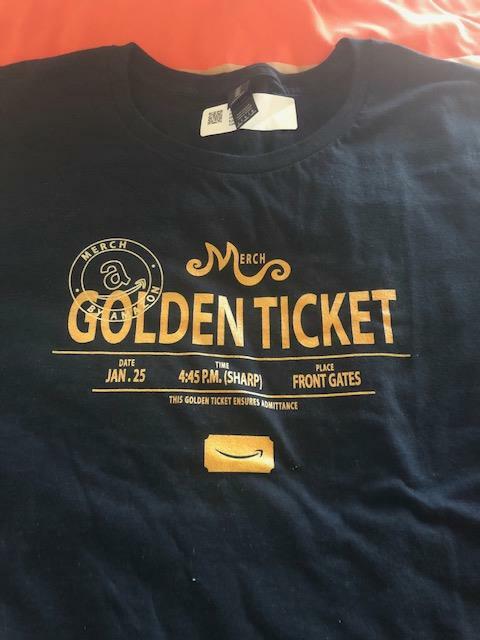 I received a Golden Ticket and was invited, along with a few other high-volume sellers, to meet with Amazon about the Merch By Amazon (MBA) program! We had to sign NDAs (Non Disclosure Agreements), but I CAN say that it made me even more proud and excited to be a part of this amazing passive income opportunity. They even created a shirt design for us that we got to print ourselves! The team was super cool and treated us to a nice dinner with some delicious desserts! We were all pretty vocal about the things we like/didn’t like, suggestions, etc. Before the meetup, certain things about Merch would really frustrate me. But after talking to the team it made realize how hard they’re working to improve on many different fronts. These people LOVE THEIR COMPANY. You can see Amazon has a certain standard for the kind of people they hire. The Merch team is extremely passionate and dedicated to the program, and it was really cool to see their energy and positive outlook on the future of (MBA). Merch By Amazon caused a COMPLETE detour with my business in late 2016. I saw the potential and knew I had to focus on it as soon as I got in. To date, I’ve sold nearly 10,000 shirts on Amazon alone, and never dreamed T-shirts would be a big part of my income stream. But I’m actually glad Merch distracted me because I was about to make a BIG mistake by creating the site about selling online courses from your WordPress site. I was trying to force myself into a niche that I wasn’t really passionate about JUST to have a more focused/niche site. I also felt some pressure to start a new site because I really wanted to see what it was like to begin TODAY so I could share more relevant lessons. I was definitely forcing ideas for that reason as well. When I launched Passive Shirt Profits in June of last year, I knew that social media wasn’t going to be a big part of my marketing strategy. That may sound crazy to you in 2018, but if you know me, you already know that social media marketing has NEVER been a strength OR favorite of mine. As a matter of fact, MARKETING IN GENERAL has never been a strength. What you need to understand is that being proficient at teaching, making videos, and being admired online doesn’t automatically qualify you as a great Internet marketer who knows how to sell their own products. All I knew was that I wasn’t going to stress myself out trying to grow another social media account I would probably abandon. So I decided to start with podcasting. I really wanted to see how much traction I could gain with doing nothing but focusing on that. I also wanted to challenge the “Be Everywhere” strategy that a lot of newcomers feel they need to adhere to when starting a website. My goal was to commit to podcasting weekly to see if it would drive people into my courses. I launched my first show in May, 2017. Sales Were Off To a Great Start! You may remember that the initial launch for PSP was great. It was a good decision to offer a bundle package that was priced lower than the total price of all courses individually because most people bought the bundle. The sales were mostly from people who found out about PSP from THIS site. The REAL tell would be the results AFTER the initial launch. Well let me just say that after launch, things were slow. So slow that I wondered if I should keep podcasting. But the more I did it, the more I enjoyed it so I decided to keep going in spite of doubts creeping up. Then in December, things started to slowly turn around. Suddenly sales went from very sporadic to several per week. So my listeners and email list subscribers who had been waiting to get approved, decided to enroll. My podcast downloads started increasing and so did my course sales! I launch a show every Monday so those are the peaks you see. I think it’s very important to maintain a rhythm with podcasting. I took a 6 week break between Thanksgiving and the New Year, so that’s why you see the spike on January 8th. But here’s the cool part…. I recently had my BEST. WEEK. EVER. for the PSP courses, and it was really encouraging to finally have a bit more momentum. Don’t get me wrong. I’m not getting numbers like this all the time, but compared to how things started, I’ll take it! PSP doesn’t get many comments or social shares. And if that’s what you view to judge the success of a website, well then you’d see it as a complete failure. But ironically, it’s converting better with courses than this site did with a larger traffic base! So yeah, no complaints here! Don’t get caught up in social shares, traffic and comments. They don’t always equate to more income. Keep Pushing No Matter What! Let me tell you. It gets quite discouraging in the early days of building a new site as many of you know! It was a VERY humbling experience after having instant success with 2 Create a Website. This site just TOOK OFF like a rocket thanks to Google back in the day, and PSP has been NOTHING like that. I knew I wasn’t going to have the luxury of building up my search engine traffic to 2,000 visits per day in the first two months like I did with 2Create years ago. Even though I was prepared for a slow start, it doesn’t mean it was easy to swallow. It took 8 months for me to really feel like momentum was picking up, and I know many people would have given up LONG before then. That’s why you have to keep pushing and give it time. And that’s EXACTLY why I wanted to share this. I think it’s equally important you hear when things are challenging, and not just when they’re great. I know how overwhelming some of you feel when you’re just starting online today. With Instagram, SnapChat, Twitter, YouTube, Facebook and so many options to choose from, it can feel like you have a gigantic hill to climb. But I’m here to tell you to START SMALL. 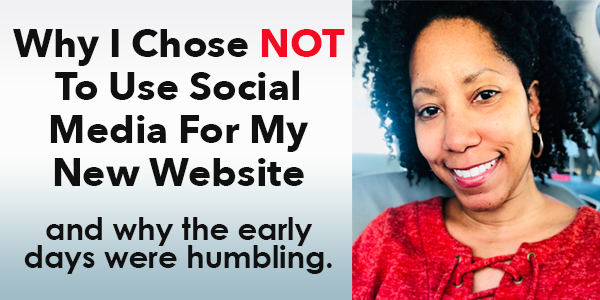 Most people are never GREAT with every social media site. They typically focus on one or two. You have to remember, when you see big influencers with 5 and 6-digit followers on multiple sites, usually it’s because they focused on one or two and the other accounts grew because of the success of the initial accounts. So it’s not like they are spending that much time and energy on every site. And who cares about the number of followers if you aren’t turning those followers into customers! Be careful of getting distracted by looking or being popular on social media. So focus on ONE platform that fits your style and audience, and commit yourself to growing that for the next 6 months. The beauty of concentrating on one strategy is it will very clear if it’s working or not. Staying focused is often a challenge for me, but I stuck with podcasting, even when I wasn’t sure it was the best thing to do. And the great thing about my show is every episode is only 5-10 minutes long. So it only takes me an hour or so to record, edit and publish each episode. I set a realistic goal for myself that I knew I could meet, and that is so important. Plus, it feels sooooooo good to know I don’t HAVE to be on every platform. I no longer get social media marketing FOMO (fear of missing out). For the record, I’m not suggesting that you ignore social media. I believe most people SHOULD consider using it today. This was just a personal decision for ME. I have a unique situation with multiple income sources (some are recurring), so I didn’t feel like social media was something I HAD to do. Having said that, I TOTALLY APPROVE the podcast-only strategy for starting out — especially if you’re in a niche where podcasting is hot. Just remember, you don’t have to be everywhere. It’s a myth. Even though I feel PSP has earned what I put into it now (effort wise), there’s so much more I COULD be doing to earn even more. I’m very happy with what I’ve accomplished, but I still have a ways to go. I haven’t setup many marketing funnels, don’t do much with landing pages, my email list, etc. I am now getting help with those aspects of marketing. Entrepreneurs who are incredibly successful focus on what they do best and outsource the rest. And I’m JUST now getting comfortable with doing more of that. I’ve also grown a lot personally and professionally in the last year. I’ve set boundaries for what I will and won’t do in my business both online AND offline. Boundaries are something a lot of women entrepreneurs struggle with. Google it. It’s like an epidemic! Maintaining that boundary without feeling selfish or mean has often been a challenge for me. But I had to do something because things were getting out of balance in my business. Don’t feel sorry for me. I created that monster by operating in “people pleasing” mode. I just recorded a podcast on this very subject. Stay tuned. It’s also been incredibly rewarding to create additional income streams. That’s something you HAVE to do as an entrepreneur. My income sources look a LOT different from when I started online, and thanks to Etsy, PSP and Amazon, I’ve developed some new ones in the last 14 months. And I have to mention AdSense because I’m always asked about it. Seriously, if I make a $1,000 month, I’m having a good month. Fortunately, I’ve more than replaced those earnings with other income streams. If you expect everything to remain the same out here, you’re in the wrong place. The only constant is change! Three years from now, I might be talking about Merch in past tense and on to something else. That’s just how it goes. But I’m going to ride this Merch train ’til the wheels fall off! 🙂 And it’s been a fun ride! Anywho, I just wanted to update you all because it’s been a minute since I blogged. Hi Lisa, thanks for sharing such a great knowledge. Its make my research more enlighten on “we dont need social media to make money”. I hope you can share more as i always waiting for your writing. Great post Lisa… Wow 10,000 t-shirts, I got in with Merch in it’s early stages (glad I did) and I find designing tees is almost therapeutic, for me anyway. Have you tried Amazon Merch? Seems like the next big thing. Yes there where I make a large part of my income now. That’s a great some great progress! You should be proud of yourself. Please make more posts about WebSite Building journey and Tools to use for online businesses. Thank You so Much for sharing such awesome stuff with Us. How i can start a Course and How to Promote Course To Get more Enrollment. Please Give me some Pro Advice to Create a Course Like Pro. I was going through line by line it was just Astounding, and I can go through this post again and again. This line “Just because people are clicking LIKE doesn’t mean they will click BUY” it is lit! I have bookmarked this page. Thank you, Lisa. Beautiful content. I fully agree with the “Keep Pushing” because persistence is the soul of any successful business. Hi Lisa, I was going through line by line it was just Astounding, and I can go through this post again and again. This line “Just because people are clicking LIKE doesn’t mean they will click BUY” it is lit! You are so absolutely right Lisa! Things are not like they use to be back in the day online. Now, the internet is so super saturated and the big giants like Google and Facebook are not cutting us any slacks at all as far as showing our content. The old website is all the way up in search engine but the new one is nowhere to be found, which means we have to find new ways of gaining traffic and you are still a genius at that. Thank you for your post an Merch Amazon. I will definitely look into it. I did follow you a short while after you started with Spreadshirt and my shirts are doing pretty well. I’ll need to uplevel the designs to be on Merch I see, but I’ll dedicate some time to work on that. BTW Congratulations on all your accomplishments! You so deserve every bit of the acknowledgments and accolades. Hello Lisa, 2018 has been a very promising year, I identify with you, and with your words, because I’m also starting a new professional challenge, I’m starting from the bottom up, and discovering how you new talent amidst difficulties and I am really enjoying it, 2018 will surely be a year of new discoveries in myself, and it will reflect on every aspect of my life. Congratulations on the post and the courage to put into practice for yourself, what has advised us in your posts, I accompany you here from São Paulo Brazil, thanks to the internet, which today enables and gives us the condition to seek quality content such as Thanks for the valuable tips. I read this blog post when it originally posted and made a note of coming back to comment later and forgot to do so. So here I am again, rereading the post. I’ve been following you for years. I remember this website from back in the day when Adsense was alive and prosperous. LOL Boy has time flown! I commend you for sticking with what you felt was important and doable for you. I absolutely L.O.V.E how you say you’ve done things your way. And your comment that you’re not good at internet marketing just blew me away!! So many internet entrepreneurs feel they have to be, but you’ve proved that’s not the most qualifying factor for success. I’ve been in the fight of trying to make money online since 2008, but I’ve never had a solid plan or business model. I’ve just followed the crowd and when you follow the crowd, you start suffering from shiny new object syndrome. I’ve done this and that, and while it’s enabled me to make money, it’s never been consistent or solid enough for me to create a full time income with. It wasn’t until last year that I realized that I had to lock down what I enjoy doing that is sustainable and profitable. I think some of us get distracted and start following the money, which just leads to struggle, burnout and eventually failure. Your blog post spoke to me on so many levels. I tried using social media as a sole means of building my business and I must say that I’ve grown to dislike Facebook so much because of it. I love that you’ve never allowed the talk of others and what they say you should be doing to cloud your judgement – A true Rebel! I’m extremely proud of you and the success that you’ve had over the years since I’ve been following you. You are an amazing leader and teacher!! I truly enjoy your blog posts, podcasts, and courses!! I’ve learned so much from you over the years and look forward to learning more and following your journey. I am JUST now getting to see and approve this post! It’s funny you used the word “rebel” because that’s exactly how I feel when it comes to social media marketing. LOL! I sometimes feel like an outsider when I hear other marketers discuss it, but at the same time I feel a bit of freedom not feeling like I have to be there. And with all the Facebook privacy stuff going on, it turns me off even more. I think shiny object syndrome is probably one of THE most common issues my audience faces based on what I hear from them. So you are definitely not alone! I struggle with that sometimes too! I really appreciate your support of my courses and posts through all these years. Your words really do mean a lot so thank you for coming by to share that. Great story. Enjoyed reading through it. Agree with the “keep pushing”. Persistence does pay off in business and elsewhere. Thanks for sharing. Mu first design was approved next day after I uploaded. Happy with it, but…the I still work on review website, which takes some time yet. I also signed up for Amazon Affiliate which I use now to promote my t-shirt design. I was wondering if Seller Account is necessary and if it helps. I think this is good for real seller via fulfillment of own products. Anyway, I don`t upload everyday because there is a lot to learn. I also found that for short sleeve T-shirt and long one I must upload separate the same design. I have just started, but would like to sell asap. LOL. Not easy task, or I`d say marketing and promotion is not easy. Never Give Up ! I will make it sooner or later. I tried FB post boost. Forget it! I stopped. I felt cheated by FB. I consider to purchase your course, but at the moment I have more important financial obligation. Let`s see later this month. Agree with you 1000%. This is Ripped off. I closed my FP anyway. I don`t like FB and never really liked. I don`t have FB app on my iPhone and even deleted Whatsapp too. WA was hard because a bunch of people are there and now became quiet. hahaha. They can find me on Wire (European secure), Signal (getting momentum open source secure) and Viber (suspect tracking though). FB for me is just to read Pages I like and I belong to 2 Groups which are there to stay for time being. All updates are there and so on. Besides, I open FB on PC once per 3 days to scroll it through and log off. Joined MeWe at the moment. Very quiet yet. I consider for my consulting business to try to advert on LinkedIn as this is something serious and target “big boys” and for Tees maybe Instagram (still FB product, but let`s see.) I have a lot to learn yet when comes to online promotion, but try to avoid expensive and greedy FB who will decide for me how much money to grab it. I read forums where people spend thousands on tees ads on FB and had zero sales. You are never “butting in!” I love it when people share their experiences so thank you! I used to boost FB posts all the time, but in the last year the results have been awful so I stopped. Today morning I received email from Merch Amazon. I have been approved within 5 days ! I mentioned in my post above about applying without invitation on Monday 19th. After submission it shows message that it takes them 60 days to make decision. I`m so happy to be on board so quick. My first design will be uploaded this weekend. Yeah! Lisa, this is also thanks to your blog. I`m glad I read again and again, also watched your YT Videos. Love your positivism and courage. Let`s see how it will turn out for me. I don`t expect WOW in short time, but from now on I must work harder. Wow! You got in quickly! I wish that would have happened to me! Enjoy the ride, Adam. It’s a great one! What I like about you is that you are yourself and show this to everyone. Many of us scare for some reason to be out there. I`m not good in writing and none native-English speaker. However, I like to talk, therefore I think more about video or podcast. You inspired me with your determination when you wrote about podcast where no one was listening but you kept going. I would probably close down. Give up is easy! isn`t it? This is why I know that it was the reason I have never made it. To find keywords, writing around them without any idea how, SEO, Google, Mailing list (I have GetResponse) but barely use it and so on was too much and I didn`t understand it. There are too many things on the net and I thought without them and proper coaching and a lot of investment I won`t make it. Your post clarifies a few things about those social media. When comes to comments or Likes, you`re right, many people determine your or company success based on those things. It`s easy to buy LIKES and then have no engagement at all. I listen Gary Vaynerchuk who also said something about it in one of his video. I`m a photographer and also designed just a few things on Illustrator, put on pages where they sell cups, t-shirts etc but I only sold 2 iPhone covers and earned a lot ($1), but I was happy and grateful, because it worked. I signed up for MBA 2 days ago and found at the end that it takes 60 days for Amazon to decide (assign me invitation?). Quite long. Lisa, when you invite someone, does this make the process faster? Thanks again and be as you are. I`m going to be here more often from now on. Adam, just getting around to reading your reply. First of all, I think your English is great since it’s not your native language! You wrote this very clearly and I was able to understand it. I’m glad you stopped chasing the get rick quick stuff. It’s an easy trap to fall into, but glad you moved past that. I saw your other reply about getting approved for Merch. Good for you! Thank you Lisa for positive words. I appreciate it. Let`s leave the past behind. I`ve learned the lesson. It`s never too late to wake up as long as we are healthy and can work. Lisa, congratulations on your continued success and thanks for all your valuable teachings and advice. Very very interesting post! You shared a lot! This post reminds me of a new kid on the block who never left the block and just discovered what’s around the corner…. your post reminds me of what i was told by a mentor of mine when i was doing real estate….he said….you don’t have to have a million bucks, just look like you do….i think a lot of internet “gurus” or “advice givers” follow that…. I have NEVER been one to listen to “Follow your Passion”…or blog about your passion…yeah right…that is so rehearsed and so worn out….i would tell people who would say that to me…my passion was “rocks”….of course i was joking but i just thought that was bad advice for me…. i think the majority of internet entrepreneurs passion is “making money”…money is a passion…that opens up endless possibilities…. i’m not saying chase shiny objects or make money an obsession….but as you go you get smarter (or at least you should) you start seeing through a whole lot of crappy advice and crappy tools (after you’ve been burned a few times)….and you learn to do things on your own…. you will find out there is a wealth of information online and when you start finding it….after a while it finds you…just like this post…. I have always been a believer in having multiple income streams….i equate it to when I was in college….i had multiple classes and i had to know what i was doing when it was time to take an exam…. when i get an email or a youtube video concerning people selling products and they say they make 4k a month….i think “really”…. this is a business and businesses have peaks and valleys…i think that’s something every entrepreneur should know and if they don’t know it they will find it out quick!…. i really like your post because you were very candid about what you thought would work versus what is working….and you didn’t find that out overnight…. perseverance is what i got from your post a will and desire to keep going forward….you didn’t fail at anything you learned what didn’t work for you…. i liked your post because of it’s honesty…. Thank you Preston. The moral of the story is, it’s a journey, and that journey won’t happen until you get out here and try things like you said. And I also think people get caught up in looking for the EXACT steps to prevent failure, but everyone’s journey will always look slightly different for numerous reasons. That’s why I try now to get too caught up in what other “gurus” tell you to do. There are just too many variables. Thank you so much for sharing your insights and story. I’m a newbie to all of this e-commerce stuff but your course on Affiliate Marketing-A Beginner’s Guide to Earning Online started the ball rolling. It has indeed be quite a challenge. I’m currently struggling with building a WordPress site but the process has been educational. I’ll keep it moving forward. Thanks for the inspiration. Glad I could get the ball rolling. Feel free to reach out to me with questions. I appreciate you enrolling in my course. Thank you Patricia! Love ya for saying that. Glad I could encourage you. You have accomplished a lot here. Congratulations! It’s awesome to follow your journey of growth as a blogger, entrepreneur, and just a humble human being in this niche. There is a lot to learn from everyone’s journey, and we have definitely learned a lot from yours. When it comes to success, you have to persevere and be super consistent with the necessary tasks to get the job done. Also, having a vision and always remembering what you are going after will keep you going when you get tired and feel burned out. You should know that at the end it will be all damn worth it! Good to see you back around the blogosphere! Thank you Freddy! There is soooooo much noise out here when it comes to teaching how to make money online and I think it’s super important for people to see the human side, even if it’s not always positive. So thank you for mentioning that and all the best to ya! its good to have you back to blogging, though mostly i would read your blogs and never left a comment but hey! this is 2018 and its time to give applause to something that has touched you like this “welcoming” post from you. it has really motivated me a lot. thanks and all the best this year. Glad you finally decided to say HI!! Wishing you all the best as well! The whole Adsense business model just never made a lot of sense to me as an Accountant. The social media can be fun but not really focused. Around 1997, started listening to Kim Komando.com out of Phoenix on the radio now over 400 radio stations and Armed Forces radio—the largest weekend tech radio show. She really took off with Podcasts and started her own store. She sounds like you write always a great inspiration opening my eyes to new horizons. Thanks so much for your example. Hi Lisa,. I miss your blog posts. Can you compare/contrast pro vs con podcasting vs bloging? That would make for a good post wouldn’t it? But just quickly I’d say the pros to blogging are that it’s universally recognized as a way to get info and people are more familiar with how to read and subscribe to blogs. It’s also faster to publish a blog post. The downside? If you have a new site today, it’s harder to get noticed with blogging alone. As far as podcasting, it’s becoming more mainstream, especially with busy people who don’t have time to sit and read a blog. They can listen on the go. I know I listen to podcasts while doing chores, taking bubble baths, driving, working out, you name it. The downside is there are a lot of people who still aren’t up on listening to podcasts, even though that’s changing. It also involves more tech than blogging. It’s also harder to track conversions unless you use specific URLs when announcing them on your blog. The reason I knew the podcast was working for me is I wasn’t using anything else so it was easy to track. That’s why I think a mixture of both blogging and podcasting is ideal because you’ll have some that prefer one over the other. I know with this site, many people have told me they don’t listen to podcasts and others say they only listen to podcasts. Great info as usual, thanks! Very interesting article. I never thought that one could be successful without social media. You have proved me wrong. Happy to have this information. Think I’ll keep using social media but maybe not make it a make or break kind of thing. Thanks for opening my eyes. This is nice peace of text which make me to feel better. I will push harder, and maybe one day…. Anyway, great writing as always, you have that can-do attitude for sure. I’m considering taking one of your courses, but Amazon’s print shirt business doesn’t seem that big in UK as its across the Pond. It seems down here, more people design their own shirts or buy ‘original’, branded items. Would be interested to see the actual comparison in traffic/sales between Amazon UK and .com, in terms of their printed t shirts, but I doubt it (publicly) exists or they want to publish it. Finally, keep up the good work, you seem to have that Midas touch lately! All the best. Peace! You have to remember some of that… actually most of that is YouTube. I did a lot more videos in the last 6 months than I have in a while, so that gave me a nice little boost recently. I don’t even have many AdSense ads on my actual site anymore. As far as being in the UK it doesn’t matter. You are designing for the US market. I have several students from across the pond. You aren’t selling the shirts to people in the UK. We sell great sheets and I’m thinking about podcasting… I’m a textile engineer and I started the flannel sheet industry years ago… I can talk about sheets all day! You mention the niche needs to be “hot.” How would I know if a sheets podcast could work? And is there a good course or book (“Podcasts for Idiots”) that you recommend? I’m so discouraged after trying to grow our FB, Twitter, Instagram & Pinterest base for the last two years. Pat Flynn has one of the highest rated podcast courses I’ve seen. It’s not cheap but I’ve heard soooooooo many good things about it. He built his podcast up long before most people even knew what podcasting even was. I’d highly recommend splurging on it. I honestly don’t know of any well done courses I can recommend. https://courses.smartpassiveincome.com/p/power-up-podcasting (no affiliation). The easiest way to see how hot podcasting is in your space is to look at some of the high-rated shows on iTunes but you can also do this. Search for some keywords you’d use to find your potential show and see if you see several related shows with lots of reviews. The thing you have to remember about podcasts is that people listen for information. They don’t listen to be pitched to. So you have to think about creating a show that gives more information than it sells sheets. I know that sounds counterintuitive, but you certainly don’t want to just make shows about promotion. So for example, you could do a “Better Nights Sleep Podcast” where you give busy people or insomniacs tips for getting an amazing night’s sleep. And then at the end of your show you could promote your products. Or you can build your website address into the intro like I did so it’s mentioned on every show. Podcasting is about supply and demand just like anything else. Make sure that the content you are putting out is in demand FIRST and as I said, you can do some of the things I mentioned above. Just off the top of my head, getting quality sleep is a GREAT way to approach this. Think of all the people who are sleep deprived, overworked and don’t have time to sleep. There’s all kinds of things we can do in our lives to sleep better. Podcasts are loved by BUSY people who like info on the go. And busy people often suffer from sleep deprivation. The perfect segway for your tips and products! Lisa, you are the best, Very real, very down to earth. That’s why you have remained at the top of my list. Words cannot begin to express how excited I get whenever I see a post or podcast from you. You are the real deal. I love how candid you are with your advice. It truly is refreshing to see someone give the pros and cons of social media. My background is in Marketing. I’ve been in the corporate world for 14 years and I can honestly say I’ve got a love/hate relationship with social media. I think so many people are buying into the “Be Everywhere at Once” strategy because they are comparing themselves to large companies. These companies have HUGE teams (I know because I have been on them-lol) to execute their strategies. It is extremely unfair to compare yourself to other people, so imagine how one will stack up against a large company… It is exhausting if you try to be everywhere at once. Not to mention, it’s completely unnecessary. We (myself included-lol) need to focus on the platforms that bring us joy whereby we can connect with our audience. If it feels like you’re trying to force a connection it won’t work no matter where you decide to set up shop. Again, thank you so much for all of the awesome advice. I’m hoping to start killing it on Merch, one of these days. Well said, Tosha! Especially about the TEAM. I think people forget that. Some of these people make it look so easy but we never have any idea how much time and money they are spending on the backend. Thank you so, so, so much for those kind words! In a world of fluff, I really strive to maintain that realness that the make money online space needs. That’s soooo important to me. People need to know it’s a hustle and there are ups and downs no matter how long you’ve been out here! This post is so encouraging for me. You have no idea. I’ve been following you since 2013. Your information have been on point. Oh and I’ve taken a few of your courses. Thanks for this post! Really? Cool! As much as I love making money, I also LOVE to encourage others. Much of of my advice comes from a very personal place so I’m glad you feel encouraged, Katina! I would HIGHLY recommend you streamline the site down to one topic. That alone will cut down on the “chaos” as you’ve described. You’ll also attract a more targeted audience. This is a common thing people do with sites. They believe more topics are better but it’s actually hurting the site because it’s harder to attract a loyal follower. Think niche and choose one topic. Good luck! What I have always loved about you is the fact that you always kept it real with no fluff about what you do or how you do it. I truly having been bragging about you and your success for almost a decade. Keep Grinding Girl! Thank you! Ten years!!! Wow! Appreciate your support over the years, Joe! Hello where can I find your podcast? Guess I should have included that huh? LOL It’s https://passiveshirtprofits.com/podcast/ You can also open up your smartphone podcast app and subscribe through there. That’s how most listen. Holaaa Lisa! Sooo refreshing to read this post from you ladybug and a HUGEEEE thanks for the mention. I absolutely love the quote that you added in your post that says -“Don’t get caught up in social shares, traffic and comments. They don’t always equate to more income”. Everytime I start getting off course and even trying to get caught up in likes, shares and etc, my mentor puts me right back on track. He’s told me stories you would not believe about people with millions of followers on social media that can’t sell $5 ebooks (ouch right)? So, I am glad that you addressed this in your post. It was also exciting to read about your meeting with the Amazon peeps. Its good to hear that they are a company that really listens and wants to get feedback from folks using their platform. :-). Wishing you all of the BEST this year and because of you I am getting more into podcasting (Yayy for that). Oh and……what Mic do you use for your podcasts? Oh I believe it! There’s so much noise and fluff out there about social media. I really like that you focus on results when you do your teaching about it. There’s not enough of that out here. If I see one more webinar or blog post about “how to grow your [X] in 3 Days” I know that’s what gets people interested but I’m like… Growing my list or followers has never been much of an issue with me… but let’s talk about CONVERTING that traffic into income. I use a Blue Yeti, but if I could do it all over again I’d get the ATR-2100 by Audio Technica. The Blue Yeti is extremely sensitive and I believe the ATR is less expensive. So happy you are jumping into podcasting! Don’t forget to share your show link with me when you launch and feel free to reach out with questions. Hey Lisa! Yes indeedy ladybug. You are so right about all of the gurus out there shuckin and jiving (ughhh) with how to do X in 10 days! Thank you for this Very “Human” post! It is so refreshing to read. To know that you struggle with some of the same issues that we all struggle with. I have backed way off of social media. I still keep up with my YouTube channel, but only because I have a following and I feel a connection with so many of my fans. Facebook is second, for the same reasons. Twitter and Instagram are occasional. I plan to do more with my email list in 2018. I would love to do Etsy, but have not been able to carve out the time. Thanks for keeping it REAL Lisa! Thanks Marcia! I think it’s always important to discuss the negative as much as the positive. We are all human and no one gets everything right. It’s been really great chatting it up with you in the PSP student group. Thanks for participating and being a part of the crew! Thanks once again Lisa, you are such an inspirational to some of us. Keep going and going…. Hey, Lisa! Thank you for the update. I FINALLY got a chance to start my PSP course, and I am loving it. I thought learning Photoshop would be a daunting task, but you make learning easy! Did you use Photoshop to create your blog graphic? It is really nice! Yaaaay! That makes me so happy to hear, Amy! Yes, I did. I create all my blog graphics with Photoshop. You should be so proud of yourself. I am happy to see your potential being actualized. The key takeaway is just how well you have ADAPTED to changing market forces, de-emphasizing a long-time champion (AdSense) and hitching your wagon to the Amazon Merch train. You are an inspiration in so many ways, thank you! Let’s talk about “Be Everywhere.” My opinion (and it is just that) is based on something you alluded to in your post: momentum. In marketing (which is the essential point of Social Media), your goal is to maximize the channel before testing a new one. The Pat Flynn methodology is not a myth. He started with a blog and, if you note how he talks about it, the TRAFFIC LEVELED OFF. There was the maximum traffic each day, and he wanted to reach more people. At that point, he started looking into YouTube. Perhaps people misconstrue this targeted, LINEAR approach with some vague idea of simultaneously opening accounts on every channel, and when things don’t work out, they blame the buzzword and not their implementation. Look at a subset of this concept: Google Adwords. You can’t possibly test dozens of keywords effectively. So, instead, you put a control ad out there. Then you work to beat it. Once you beat several versions, and you are making more than you spend, THEN and ONLY THEN, do you turn on the marketing spend firehose for that campaign. Keep on plugging away, Lisa. I look forward to your next milestone! Mitch, that makes PERFECT sense and love the analogy! I think we both agree that the main thing is you need a strategy and I know for me… I never took time to create one. But you’re right… once you grow ONE, you can scale that faster. So yeah, I see what you’re saying. I wish you all the best with your freelance biz! I still plan to do a blog post about the Marketing DNA test you shared with me. I thought that was incredibly cool and it was really accurate. Thanks, Lisa! I’ll be looking forward to that DNA post! I can relate to everything you’ve written, AWESOME post! Hey Lameka! Good to see you here. Thank you! Very Awesome Stuff – Thank You Very Much For Sharing It.